Amid high illicit crop production figures in Afghanistan, UNODC has scaled up its work with partners to promote innovative strategies to integrate a development perspective into the country’s drug control efforts. 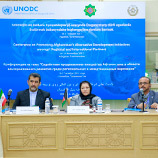 Recently, UNODC teamed up with the Ministry for Counter Narcotics of Afghanistan to host a two-day conference on “Promoting Afghanistan’s Alternative Development Initiatives among Regional and International partners” in Ashgabat, Turkmenistan. Organized in the context of the 7th Regional Economic Cooperation Conference on Afghanistan, the event sought to increase awareness and identify opportunities for alternative development among neighboring countries. It also provided a platform to explore new partnerships between agencies working on drug control and development. Yury Fedotov, UNODC Executive Director, delivering his remarks through a video message, said that “Alternative development can help transform communities, but they can only flourish where the rule of law and sustainable licit economies are strong.” He highlighted that the Government of Afghanistan, through its National Peace and Development Framework and National Drug Action Plan, has laid a strong foundation to build coordinated and integrated cooperation. “But these efforts require the strong support of the international community,” Mr. Fedotov added. UNODC’s 2017 Afghan Opium Survey shows that opium poppy cultivation and drug production chain generate huge profits, supporting criminality and insurgency, and ultimately resulting in greater insecurity. “There is no way to achieve a viable and sustainable social and economic development unless we tackle the drugs issue and insecurity,” Mr. Milsom stressed. Also participating, Roland Kobia, Special Representative of the European Union to Afghanistan, defined alternative development as a long-term strategy that seeks a sustainable move away from illicit drug cultivation. “Access to markets is crucial to allow farmers to generate sufficient revenue to maintain a decent standard of living,” he pointed out. Professor Salamat Azimi, Minister for Counter Narcotics of Afghanistan stressed that her country was truly committed to fighting narcotics. Citing an example, she said that the Government was developing national policies to support relevant Ministries in achieving this goal. Over 70 senior officials and participants from Afghanistan and several senior officials from Pakistan, Iran, Kazakhstan, Kyrgyzstan, Tajikistan, Uzbekistan, Turkmenistan, Colombia and Thailand attended the event, funded by the European Union, Japan, the Russian Federation and the United States. For over 40 years, UNODC has been working with Member States on alternative development, a principal pillar of the international drug control strategy. In Afghanistan, most illegal cultivation is driven by poverty, food insecurity, and the lack of land tenure. Alternative development seeks to reduce illicit crop cultivation and drug production by generating licit income and opportunities while providing a range of social services. Hands on Peer Education, is a front-line service in Dublin’s north inner city, where those suffering with addiction and their families can get access to much needed support and treatment options. H.O.P.E. facilitates and advocates for recovery through abstinence. We also offer a wide range of advocacy services. H.O.P.E.’s free and confidential drop-in clinic is open from 10am ‘til 1pm, Monday to Friday. Many thanks from the team in H.O.P.E.